After armed confrontation nearby on January 2, 1847, and a truce meeting the following day, Marine Capt. 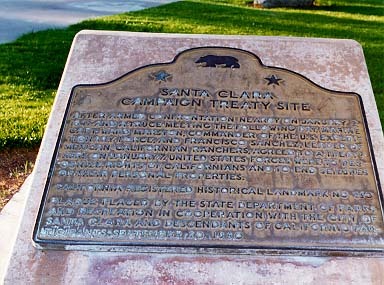 Ward Marston, commander of the U.S. Expeditionary Forces, and Francisco Sanchez, leader of Mexican Californian ranchers, agreed to a treaty here on January 7. United States forces were to recognize rights of Californians and to end seizures of their personal properties. Civic Center Park, NE corner of El Camino Real and Lincoln St, Santa Clara. Return to other landmarks in Santa Clara county.